We are proud to be a local, family owned business who have chosen to live and raise a family in Thousand Oaks. We love participating in church, school and the many amazing community based activities this area has to offer. We appreciate your business and trust you will value knowing when you do business with us, you are doing business with your neighbor, keeping not only ‘Thousand Oaks Strong’, but the entire ‘Conejo Valley Strong’. Every day we are filled with gratitude in our hearts for this blessing. To provide an long lasting, extraordinary experience for our clients in a warm, friendly and knowledgeable environment. We promise to always do the right thing on behalf of our customers. Placing our client’s needs first, we consistently strive to improve; to deliver exceptional customer service and furnishings of the highest quality. In 1996, we opened our first furniture store with a business partner in Venice Beach, calling it Philip Paul Designs. I had a degree from UCLA but I didn’t know a thing about design or furniture. I was an “actor” which meant I actually was a waiter. Soon I earned a degree in business from the “University of Life”, learned a thing or two about furniture and design and bought out the partner. Where did we get the goofy name? From the original store in Venice Beach, we changed our name to Welcome Home Interiors (which we still use for large interior design and commercial projects). We liked the idea of helping our clients create welcoming environments in their homes. Still, when we described what we do people would say “Oh the Sofa Guy! My neighbor just bought a sectional from you guys.”; or something similar. Paul got that so often he finally gave in. We figured it’s simple, memorable, and a little goofy; but then again so is he. We embraced the moniker and today we are The Sofa Guy Inc.
We moved our business to Thousand Oaks in 2003. We started by keeping things simple; no showroom, no employees; just us, Paul and his catalogues and fabric swatches working from home and going on lots and lots of house calls. 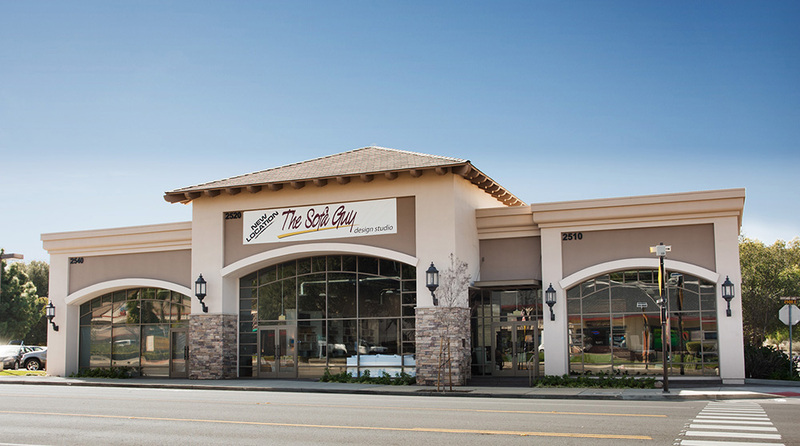 During the last 10 years we have moved the business out of the house and into the Westlake Design Center, and in 2013 we made our BIG move to Thousand Oaks Boulevard. We hope to be able to add more stores in the future and appreciate the fact that the Conejo Valley has kept us in business when the economy has been so tough these last few years.